Heavy calcium carbonate, is made from natural carbonate minerals such as calcite, marble, limestone grinding process, it is widely used as inorganic filler. According to different grinding fineness, heavy calcium powder is divided into four different specifications: solo powder (95% passing 200 mesh), Flying powder (99% passing 325 mesh), three fly powder (99.9% passing 325 mesh) and four fly powder (99.95% through 400 head), they are used for different industrial sectors. 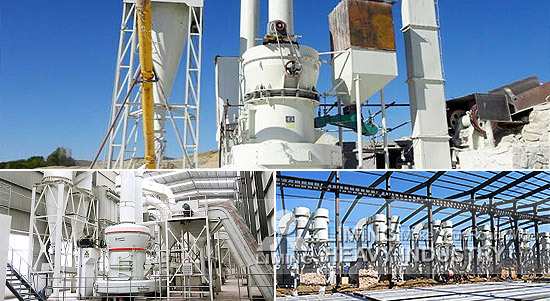 Fine powder processing generally use LM Vertical Mill, MTW European Trapezium Mill, TGM Super Pressure Trapezium Mill. Ultrafine powder processing generally use LUM Series Superfine Vertical Roller Grinding Mill and MW Series Micro Powder Mill. Grinding material through the separator to screening, unqualified powder will be returned to the grinding machine. Finished powder through the discharge port to finished product silos. Depending on the materials, fineness and applications, the production process can be adjust. For details, please contact to our online customer service.